Fraternizing with the enemy was an offense for which a soldier could be court-martialed. 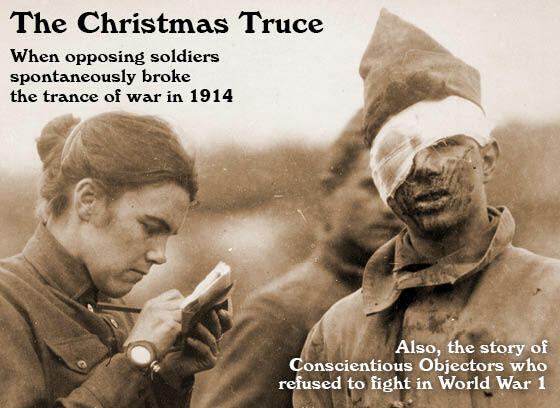 Yet on the frozen battlefield of Flanders, Belgium in the bitter first Christmas of WW1, troops on all sides broke the trance of war a century ago and—for a fleeting few hours—became friends. Previously shooting at each other from the miserable water-logged trenches, they now sang Christmas carols in different languages. They exchanged boxes of candy and cigarettes and even played a match of soccer in No Man’s Land. Until of course, the deadly mission of war resumed. 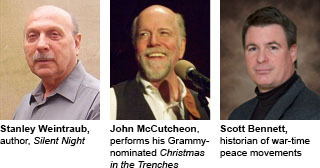 You’ll hear folksinger John McCutcheon, whose Grammy-nominated song, Christmas in the Trenches, movingly tells the story. And distinguished historian Stanley Weintraub, who searched through century-old diaries and news articles for his book, Silent Night. Author Annie Leonard, whose film “The Story of Stuff” has had over 10 million hits online, discusses ways to reduce the huge environmental toll from holiday-related purchases, but still connect with loved ones. Peace historian Scott Bennett examines the history, a century ago, of U.S. conscientious objectors in WWI, some of whom were brutalized for their opposition to the Great War (includes fascinating archival audio).